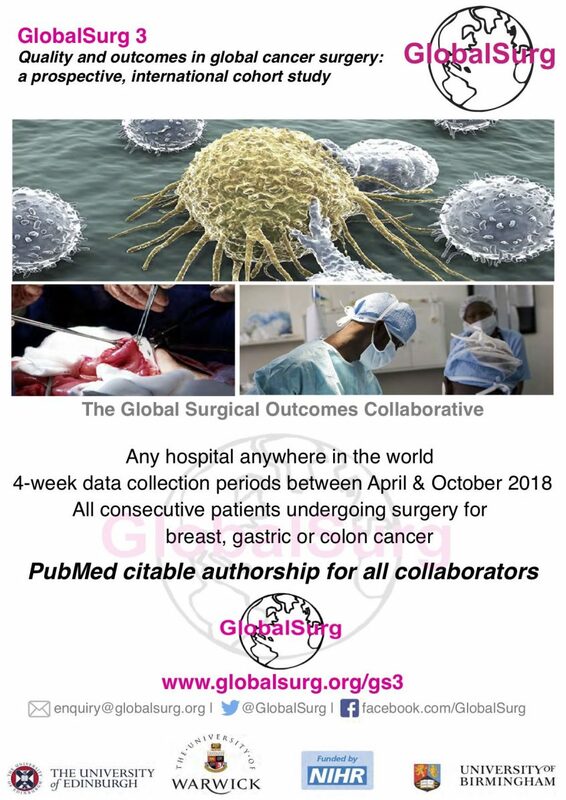 The GlobalSurg Collaborative is an international research network that focuses on improving surgical care in low- and middle-income countries. A total of 343 centres across 66 countries participated in GlobalSurg’s most recent study, which focused on surgical site infection. This was published in Lancet Infectious Diseases (impact factor 17) last month gathering widespread media attention, including the Telegraph front page, Times, Daily Mail, and BBC News. GlobalSurg has a corporate authorship policy, with all collaborators listed as PubMed-citable co-authors. The next study focuses on quality of breast, colon, and gastric cancer surgery. It is designed to be relevant to both high and low resource settings, so participation from NHS units is encouraged. Teams of up to three individuals will collect data over 4 consecutive weeks on all patients undergoing surgery for breast, colon, and gastric cancer (in very busy centres you may collect just breast or GI cases). Each patient should be followed-up for 30 days. The window for data collection runs from 1 April 2018 – 31 October 2018. Multiple teams may participate at each centre collecting data over distinct 4 week periods within the data collection window. The full protocol will shortly be published on the GlobalSurg website soon. To get involved, please enter your details on our online google sheet and link up with anyone else already interested at your site. If you have friends and colleagues abroad (particularly in low- and middle- income countries) who might be interested in participating, please do share this opportunity with them, or forward Dmitri’s email (d.nepogodiev@bham.ac.uk) contact to them. Please contact Dmitri directly if you have any questions about the project.